In addition to the Shipping Suite, we would like to draw your attention to the File Downloads & Product Attachments extension by MageWorx. The tool is designed to improve the default user experience of Magento by introducing the ability to place downloadable files on static blocks and product, category, or CMS pages. The extension lets store owners present their products in the best possible way by helping them to create informative product pages and provide customers with valuable data. With all the features offered by the tool, ecommerce merchants increase customer engagement and conversions by letting them use informative and noticeable file downloads. The File Downloads & Product Attachments module supports all popular file formats, so you can equip your website pages with PDF files, price lists, warranty agreement, user guides, video tutorials, tech documents, and whatever your customers need to know your company or products better. With the module, it is possible to add files to any page of your website, specify where precisely product attachments will be placed, track download statistics, and keep all data well organised in the Magento backend. 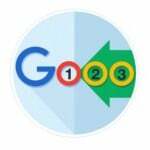 You can also decide to grant or deny access to downloadable files for the specified categories of your site visitors. The Magento file upload extension is available for both Magento 2 and 1, so the version of your ecommerce platform does not matter. Furthermore, MageWorx offers a smooth transfer of all features to Magento 2 version along with 50% Magento 2 upgrade discount! As for the MageWorx File Downloads & Product Attachments for Magento 2 and 1, it supports file attachments in all popular formats, including pdf, txt, docx, jpg, avi, mow, zip, mp3, css, html, gif, png, and much more. You can place file downloads on different pages of a website, like a product, category, or CMS (“About Us”, homepage, and others) pages, as well as in static blocks. The extension offers advanced file upload options. Both Magento 2 and 1 extensions allow creating names and descriptions for any file, assigning files to a specific category, and choose an unlimited number of products for file attachment. With the module, admin users can decide to which countries file downloads can be displayed and set file download limits. Moreover, you can upload several files simultaneously and attach files to products directly from the product edit page in the admin panel. 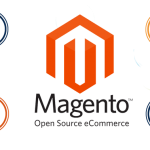 Besides, the Magento file download manager offers file download permissions (you can choose which customer groups can download Magento product attachments). For example, you can set permissions for downloading some particular files, like extensive product research, or any other valuable product information. With this feature, you can also hide downloadable files for not registered or logged in visitors and show them a motivating message about granting access to download only in case they sign up. Another essential feature is user-friendly video pop-ups, but it is currently available only with Magento 1. From the perspective of backend administrators, the MageWorx File Downloads & Product Attachments Magento extension has very convenient file management. You can quickly add new product attachments, as well as edit and remove existing ones from the backend. The module also provides the ability to choose different page positions for file downloads (though, currently this feature is implemented in Magento 1 module, so it should appear in case of Magento 2 soon). With the File Downloads extension, admin users are enabled to track the number of downloads and analyse which files are more popular with the customers. Tracking and reports are available in the module backend, so you will always know how your customers behave regarding your files. Note, that the Magento 1 tool shows more detailed data related to downloads, but MageWorx is going to update the Magento 2 module with the same functionality. 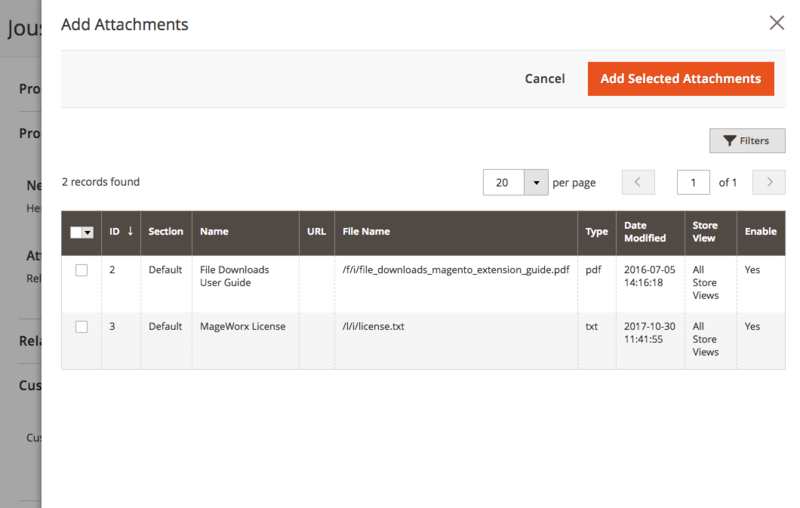 In the backend, the Magento file upload extension is available under Stores -> MageWorx Downloads. Action (you can edit or delete each section from this column). 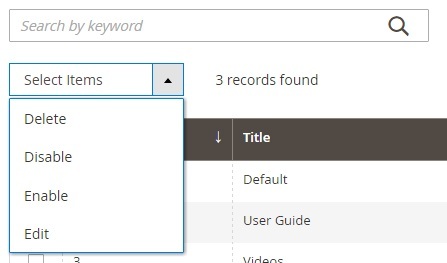 It is possible to search sections by keywords and apply mass actions to them (delete, disable, enable, and edit). Besides, you can apply filters: ID (from/to); Title; Description; and Enable. As for the grid itself, it is highly customisable. You can rearrange the order of columns by dragging and dropping them, hide columns (use the Columns drop-down menu), and choose a maximum number of sections per page. While creating a new section (or editing it), you have to deal with only three options: Name, Description (is not mandatory), and Is Active. As for filters, it is possible to apply up to 13 simultaneously. Now, let’s describe the Magento 2 attach PDF to product functionality. To add a new file download attachment, click on the “Add New Attachment” button in the top right corner of the page. 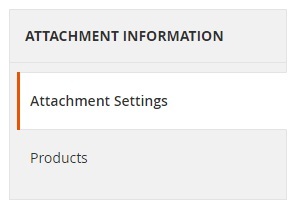 While creating a new attachment, you have to deal with two separate tabs of settings: Attachment Settings and Products. In Attachment Settings of this Magento 2 PDF upload tool, you choose a section for the attachment and specify its name, description, and downloads limit. Another important option is Assign By. 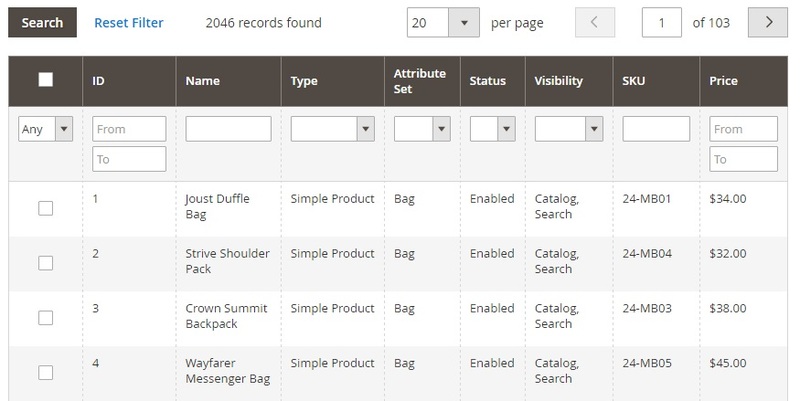 You can assign the attachment to products in a product grid or by IDs/SKUs. 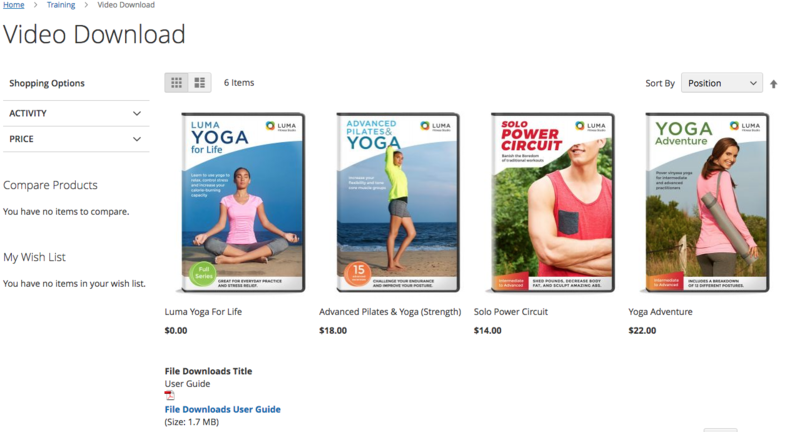 For Product IDs, you should enter each new product ID from a new line or separate them with commas. For Product SKUs, there is the same field, but you should specify SKUs here. File / URL Switcher lets you switch between these two parameters. Next, you should choose and upload your attachment (note, that its maximum size is 10 MB), choose customer groups and store view, as well as activate the new attachment. 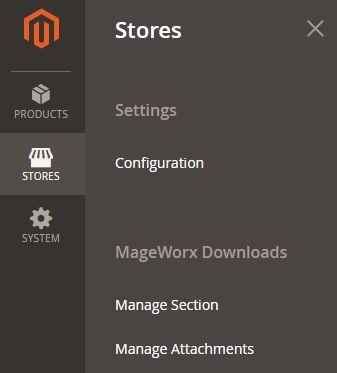 Under Stores -> Settings -> Configuration -> Mageworx -> File Downloads & Product Attachments, you can find main settings of the extension. The extension offers the possibility to add any particular file attachment on the product level – directly from the product settings. For this, open the desired product and go to the Attachments tab. From here, the store owner can add a new attachment. 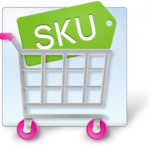 Upon clicking the button, the store owner will get the full list of the product attachments. This shows the attachment grid with the possibility to manually select the desired ones. Click the Add Selected Attachments to apply them to the product. The page receives a new tab called Downloads. All files available for the product are listed there. In the example above, you can see that such parameters as file size and type are displayed for all available attachments, but while the first file is open to all customers, the second one can be downloaded if a visitor is registered and logged in. Thus, the extension motivates visitors to register on your website or stay logged in. The extension allows the merchants to add the desired documents to any category page. File download attachments can also be added to CMS pages. Below is the example of a block with downloadable files added to the CMS page “About Us”. 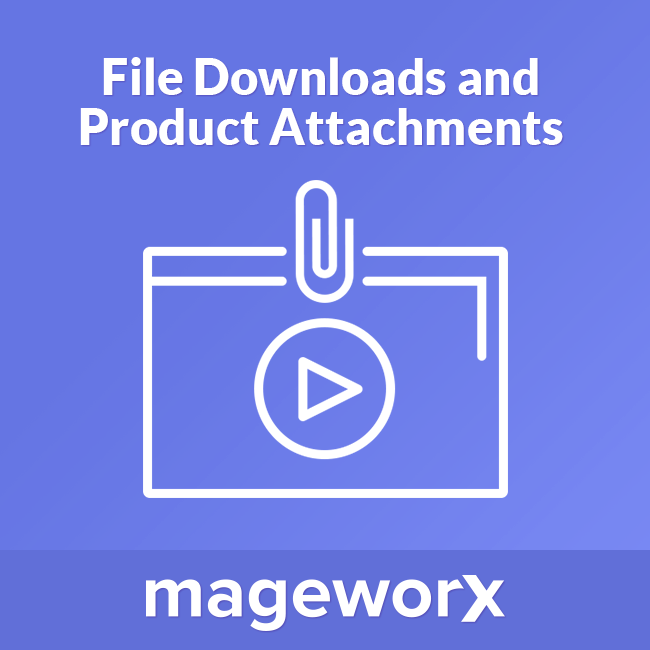 Mageworx File Downloads & Product Attachments is a very convenient tool if you are going to provide your customers with additional information about your goods and services. Unfortunately, such functionality is provided neither in default Magento 2, nor in Magento 1; but, as always, the problem can be solved with the aid of third parties. As for the price, Mageworx charges $99 for both modules. It is also necessary to mention that the company offers 50% OFF on the upgrade from Magento 1. As for updates and bug fixes, they are available for free forever.